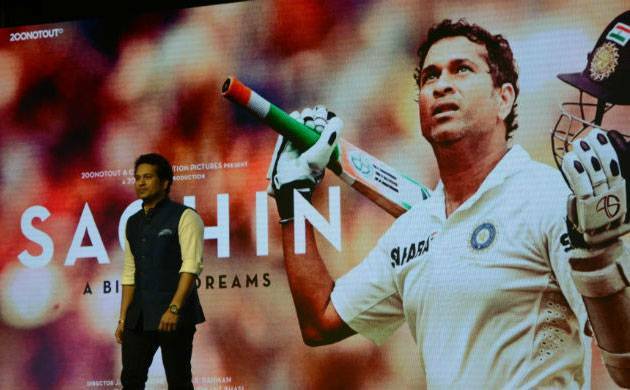 It is just a couple of hours left for Sachin Tendulkar's much awaited biopic 'Sachin: A Billion Dreams' to hit the screens. Indeed, the entire country is ecstatic to relive the stunning journey of 'Gof of cricket' and the movie is already in the headlines. The makers of Sachin's biopic recently held a premieres of the movie which was attended by big shots of B-town and the Indian cricket team. And as expected, the everyone is all gaga about 'Sachin: A Billion Dreams'. From megastar Amitabh Bachchan to Yuvraj Singh, every one has who attended the premiere was all praises for master blaster who plays himself in the biopic. The celebs took it to micro-blogging site Twitter to share their reviews of the 'Sachin: A Billion Dreams'. Shikhar Dhawan - "Loved watching @sachin_rt pajhi’s movie, its amazing. Always lovely meeting him"
K L Rahul - Congrats paaji!Had goosebumps watchin your movie.U always inspire me n ur movie will nw inspire billions! Bhuvaneshwar Kumar - "Revived some inexplicable memories today! Attended the premier of Sachin A Billion Dreams, it’s a great story by the great man"
Angad Bedi - "Our Master!! thank you for inviting me for the #SachinABiliionDreams "look after your kit.. and your kit will look after you"
Yuvraj Singh - "Great the man greater the story @sachin_rt billion dreams beautifully put together by James erskine go watch it". Harsha Bhogle - "If you have only known @sachin_rt from a distance, you will enjoy how close you get to him." Kapil Dev - "I wish #SachinABillionDreams a great success. Because no one can match you." I wish #SachinABillionDreams a great success. Because no one can match you @sachin_rt. Abhishek Bachchan - "Sachin isn’t just a person, he’s an emotion… India’s emotion! And after they see his film, the worlds emotion. congratulations"
A James Erskine directorial, 'Sachin A Billion Dreams' will hit the screens on May 26.